That’s where I differ. I don’t think I’m the greatest. I’m no bullet train. and I don’t walk across fire. I’m just a normal guy who happens to love running. So much so, that my whole life is centred around it. I work hard for it. I make some sacrifices, but I love what I do. From racing to coaching, it’s what gets me up in the morning and ready to go again, good days and bad. But I’m no different to anyone else who took to the start-line on Saturday for the Javelina 100 mile ultra race. To be honest, I’ve read a few running blogs recently, and it’s almost put me off writing any kind of race report but I feel I should, as I know there’s some genuine interest out there and the race thoroughly deserves to be documented. I had been excited about the race the minute I heard I was going. It was always going to be a relatively quick 100-miler and also meant I’d get to go back and see my buddies in Flagstaff before and after. I was confident about the race and whilst I’ll rarely make it onto anyone’s ‘favourites’ list, I do know how to run a fast 100-miler (despite being from the UK). The only slight concern for me was the heat. It was a desert after all, and if I’m honest, to date, hasn’t been an environment I’ve often found myself. I have run well in the heat before though, so took some confidence from that. Arriving at Javelina HQ on a yellow school bus just before 5am was a pretty unique way for me to build to the start of the race at 6am. After a short walk we reached the race start / finish area which was buzzing with excitement despite the chilly desert winds and darkness. The desert was stunning both at dawn and dusk and I felt incredibly lucky, running on my own on that first lap, as the sun started to show itself and reveal the surrounding beauty. Laps were 15.3 miles long and run washing machine style (go back out the way you came in), so I got my first glimpse of the competition 4 or 5 mins into my first anti-clockwise lap. Almost everyone was super-friendly and encouraging. It was pretty up-lifting and I have to thank everyone who said something nice or smiled. I did my best to return it (I hope you understood the Scottish accent). It started to get warm an hour or so after sunrise, so I was looking forward to seeing my crew at around 30 miles. Some madness on the main route from Phoenix meant that they didn’t get to HQ until lap 4 of 7, so I had to borrow some sunglasses / sun-cream and re-fill the empty bottles we had rather than grab and go. Fortunately the life-saving AJ took full control of drinks and food. We didn’t have a copy of my race plan (it was with the bag sitting in traffic) so we muddled through and AJ did a fantastic job keeping me hydrated and my spirits high. I continued to put time on the field every lap. At 61 miles, the full crew were in effect! And, my buddy Chris was able to run with me. It was nice, not just to have company, but to share the experience with such a brilliant person and someone with a huge passion and talent for trail and ultra running. From there we just moved pretty well. Stopped at aid stations mostly for ice, chatted at times and just ran easily at others. We kept an eye on Karl and Jon at the turn of the lap and stuck with a solid pace as the lead was stretching. With everything that had happened earlier in the day with the traffic situation and lack of a plan, my head was pretty wasted at the start / finish and I didn’t feel like eating any of the limited options I had with me. I knew I was running low on calories but all I could really face were HoneyStinger chews and whatever fruit I could grab at aid stations. I did try to eat, but the company and chat from the whole crew every time I stopped at HQ was much more appealing and enjoyable. On one of the latter laps, I tripped and fell (the second of the day), a sure sign that I hadn’t been getting enough calories. So from then the focus shifted a little from pace, to concentrating on my footing. At the end of lap 6 (91 miles) I knew for sure the race was in the bag – I’d just have to get around the last 10 miles. So I sat for maybe 10 mins, chatted, drank and tried to force some food down. Chris had done a sterling job getting me round 30+miles unscathed, so I’d accepted that the last 10 I’d be on my own again. I was delighted when Alicia said she was going to pace me around the final shortened lap. So much so, I left without everything I needed for the final push. There was still a chance at the CR but we knew it would be tight. Either way, I got to share more of the experience with one of the kindest people I know (as well as being a runner and coach I hugely admire). Alicia pushed me up and over the final climb where I struggled a little on the rockier sections with sore feet. The mix of headlights coming towards us and other runners side by side on some narrow sections didn’t help much either and I kicked a few rocks. At the turn-off, we supposedly had 4 miles to cover and not a lot of time to do it, so Alicia went into cruise control and I followed her into the dark on a much smoother path. I was hurting by this point and Alicia tried her best to keep me moving below 7:30’s. 4 miles seemed to pass on my watch and we still weren’t finished. BUT, what a finish. I was absolutely delighted. I was slightly dazzled by the lights and camera flashes, but when I crossed the line and finally looked up I could make out the smiling faces of my crew / friends, and for that, the whole 13hrs and 49 mins was worth it. Running hard and sharing that experience with people you care about is what really matters to me. That’s the important stuff – not being able to say I won. So, thank you Javelina. I met new people. Made some friendships stronger. Gave my folks something to be proud of. And showed that sometimes, hard work and passion is enough. Jamil Coury and his Aravaipa team for organising an incredible race. One with more positive vibes than any other I’ve ever been to. The runner experience was superb. Trucker-hats off to you. My home-boy Stevie G – the only one who’s ever believed in me. I’ll never forget that. I hope I’ll get the chance to race in the U.S again. It was a great experience, and there’s a LOT of trails out there! This entry was posted on November 4, 2015 by pyllon. 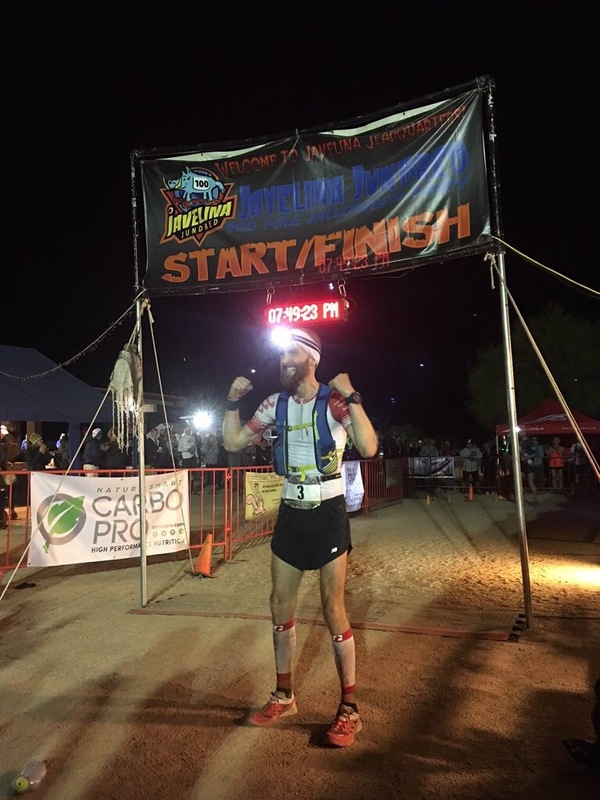 It was filed under 2015, arizona, Coaching, Feetures, HoneyStinger, Javelina 100, Javelina Jundred, Nathan, Ultra, Ultra distance, ultramarathon and was tagged with 100 miles, Arizona, Javelina 100, nathan, Paul Giblin, race, report, win.